Next, we have the winners of Telltale's annual Halloween Contest. There's quite a few neat fan-made goodies to oogle this year, and best of all: even the losers went home winners. Telltale is giving everyone who entered one of their downloadable games for free (Telltale Texas Hold’em or any episode of Sam & Max, Strong Bad’s Cool Game for Attractive People, or Bone)! Grim Fandango has been released! Grim Fandango is in stores now! Baddest of the Bands is Out Today! Telltale has released the third episode of Strong Bad's Cool Game for Attractive People today. Baddest of the Bands has Strong Bad starting and entering a Battle of the Bands contest. As always, there's a trailer for the next game with this one. Next time on SBCG4AP: Dangeresque 3: The Criminal Projective. Strong Bad will finally make the long awaited third movie in the Dangeresque buddy-cop series. Since I haven't updated in a while, there's a bit more Telltale news that I missed. The biggest news is that Sam & Max Season One is now available on retail disc for the Wii! Also, Telltale has a special promotion going on from now to Halloween where if you purchase a Strong Bad game for PC (including the season pass), you get the Sam & Max episode Night of the Raving Dead for free. Lastly, Telltale is holding their annual Halloween contest again this year. This year, they will accept fan-created epitaphs of both Sam & Max and the Homestar Runner universe. You have about 17 hours left to enter, so come on in here if you're interested. Strong Badia the Free, the second episode of Strong Bad's Cool Game for Attractive people takes the ball from Homestar Ruiner and runs like crazy. It's not quite a touch down, but it's a great step in the right direction. In Strong Badia the Free, Strong Bad is placed under house arrest after the King of Town places a tax on e-mails. Strong Bad has to find a way to get out of the house, but he has an exploding collar on his neck that will go off the moment he walks out the door. Once escaping imprisonment, he declares that he will create his own, independent nation under the Strong Badian flag. He asks the citizens of Free Country, USA to join him, but they all decide to make nations of their own. Now Strong Bad must travel to these nations and convince their leaders to join Strong Badia in it's fight against the municiplality of the King of Town. Since this is the Homestar Runner universe we are talking about, the "nations" all consist of one person (or at the most two people) in their usual stomping grounds. For instance, Marzipan's house becomes a nation, as does the House of Strong. There are locations that we haven't seen before in the game's continuity that should be quite familiar to fans of homestarrunner.com. Every location, including the locations previously seen, is well utilized as a nation. None of the locations get a major overhaul, but are given banners or new objects to show they are now countries. These are exactly the small-fry changes that the characters would make in the flash cartoons, so it's actually nice to see that Telltale didn't go overboard with the concept. The user-placable map from the last episode has been replaced with a map of the nations. In order to enter a nation at the lower portion of the map, Strong Bad has to form an alliance with the adjoining nation so he can have safe passage to the new nation. Strong Bad must play to each character's personality quirks in order for them to join forces. Each time an alliance is formed, an early-film style newsreel is shown with a narrator telling the viewers the news. This is a nice touch, and adds a lot of polish to the game making meeting the game's goals seem a lot less tedious than Homestar Ruiner. To my pleasant surprise, there is actually a great deal of character development here. We get to see one character in particular in a way never before seen. It's unchartered territory for the Homestar Runner universe, but surprisingly it actually fits in perfectly with the series' atomosphere. I loved that aspect of this game, and would love to see more of it in future games. Another thing that I really loved was that the game had Strong Bad going into drawing tangents while reading his e-mail. Strong Bad's plain reading of the e-mail last time felt a little lacking, so it was nice to see Strong Bad's trademark illustrations while he was making his point in this e-mail. I'd love to see the game get into some "made-up" territory, as is common with the Strong Bad e-mails, but as things are now I'm still a happy camper when it comes to the e-mail aspect of the games. One thing that did seem tedious this time around was the trophy quests and the Teen Girl Squad comics. Telltale did try to make things a little fresher by making the Teen Girl Squad comics chalk drawings on rock as "Cave Girl Squad" this time, but the experience still feels a little hollow. I love the Teen Girl Squad comics on homestarrunner.com, and making your own comics sounded like fun when it was announced. However, the experience feels lacking. The comics aren't exactly being made, but rather connected like a jigsaw puzzle. And, like last time, the better puzzle pieces are hidden throughout the game. This time around though, I just didn't feel like there was enough incentive towards putting in the effort to finding the pieces of comics and the trophies. It feels like just more of the same-old same-old. Strong Badia the Free is a much more satisfying game than the last. It has a fairly epic plot and a good deal of character development, but it still fits nicely within the Homestar Runner universe. The quests and comics are starting to feel tired already, but thankfully they aren't necessary to complete the game. Strong Bad's Cool Game for Attractive People is Telltale Games' new episodic series that follows in the footsteps of their previous hit, Sam & Max. Telltale has always been a company who blazes new territory in the often-forgotten genre of the graphic adventure, so Strong Bad is aiming in a slightly different direction than Sam & Max. The series is being built with the Wii gamer in mind, although it is available for both Wiiware and Windows platforms. From the moment the first game in the series, Homestar Ruiner, starts up, it's console roots become apparent with the title screen, with its message to click a button to begin. However, even here, the humor in the title is evident. Strong Bad, the series' protaganist and namesake, comments on his surroundings with many humorous quips until the player pushes a button. Once that is done, the player is taken to a menu that is themed after the menu screen of it's source material, homestarrunner.com. If you have never been there before, I strongly recommend choosing the Toons menu and then checking out some of the Strong Bad Emails. This game is funny enough to stand on its own, but it is full of so many injokes for series fans that even people who have watched just a handful of the cartoons on the site will appreciate it more. 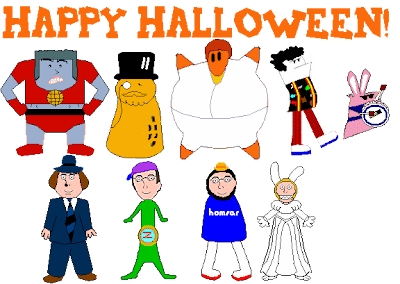 The cast of characters in the game include series regulars Strong Bad, a neer-do-well wearing a mexican wrestler mask and boxing gloves, Homestar Runner, an athlete with no arms and a spech impediment, Marzipan, Homestar's hippy on-again-off-again-girlfriend, Pom Pom, a round ball who is also an athlete of sorts, Bubs, the sketchy concession stand owner, and Coach Z, the coach at the local track who has a penchant for rapping and maintaining poor hygeine. The game begins with Strong Bad singing a very catchy song about his awesomeness, immediately followed by him checking his email on his Lappy 486. The e-mailer suggests Strong Bad "beat the snot out of Homestar", so after a humorous response to the letter, Strong Bad decides to give Homestar a pummeling. He heads to Coach Z's race track, where he finds out that there is a race and he's not invited to join. Strong Bad comes up with a plan to enter the race, and in the process ends up totally humiliating Homestar in the process. This is where the meat of the story begins. Homestar decides to move into Strong Bad's house, since he can't show his face in public, and with his warped sense of reality, he views Strong Bad as his only true friend. Now, it's up to Strong Bad to somehow restore Homestar's reputation so Homestar will finally move out of the House of Strong and things can get back to normal for our masked anti-hero. I have to say that the plot in this episode is very thin. The game is just a long Strong Bad e-mail, but it lacks much of the randomness as well as the funny out-of-character made up stories that are in the best SBEmails. It was a look into a regular day in Free Country USA, and as the email "boring" showed, there's not a whole lot of substance to a normal day here. That said, it does stay true to the source material, and the characters do stay true to their own personal nuiances throughout. The saving grace of this game though is the humor, which is top notch. Homestar Ruiner is a very funny game. There are so many injokes in this game to please fans, as well as many general jokes that even people who are just vaguely familiar with the source material should find quite funny. Strong Bad, in particular, has many quips throughout the game that truly made me chuckle. His snarkiness truly helped keep the game from feeling too dull. The game has many side activities, which is part of the game's experiment of adding in more traditional video game console-style elements. There is an Atari 2600 style game available on Strong Bad's Fun Machine in his room called Snake Boxer 5. This game is a simple game where you are a boxer who looks very much like a top down Strong Mad, who fights a Snake. There is no ending, the game just keeps getting faster and harder until you die. It's a fun distraction once or twice, but like the games from the era that it parodies, there isn't a whole lot of substance to it. The other major mini-game in the game is the ability to make Teen Girl Squad comics. These comics star stereotypical teen girls who are toatally obsessed with boys, die grusome deaths and come back in the next comic, and are voiced by Strongbad in falsetto. The object of the mini game is to combine different objects with different girls to try to get each girl to die a painful, yet humorous death. Strong Bad grades each death based on how humorous he finds it. Througout the Homestar Ruiner game world, there are more pieces of paper with Teen Girl Squad objects to find. Finding these objects and combining them with the proper time girl at the proper time causes a death that Strong Bad finds more humorous. The Teen Girl Squad score is added to your awesomeness factor, a rating by Strong Bad that also factors in other activities in the game such as annoying people or creating tree sculptures. Unlike most adventure games, this does give Homestar Ruiner some replay value. Completing the game doesn't end the collection either, as Telltale created what they call "Extended Play". Here, players can keep trying to raise their awesomeness factor as well as talk to the game's characters to hear their final thoughts on the events of the game. It's nice to see Telltale continuing to experiment with taking their games in new directions, much as they did with Sam & Max Season One. That series picked up momentum as the season went on, so I have high hopes that Telltale will do the same with Strong Bad. At this point, Strong Bad Episode 1: Homestar Ruiner is a fun game, light on plot, but heavy in humor. The mini-games and console-style collect everything side quests do help with replay value somewhat, but at this point they don't seem to add much for those who aren't completists. The ability to hear from characters in Extended Play after the story ends, however, is a very welcome feature.